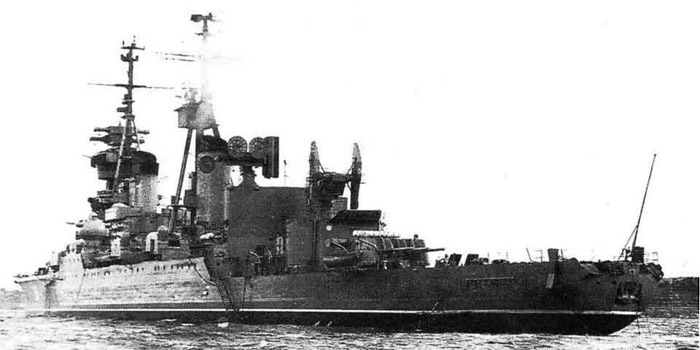 The Sverdlov class cruisers were the last soviet conventional cruisers. 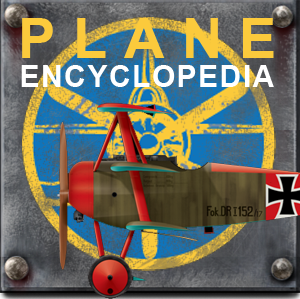 They succeeded the Chapayev launched at the beginning of the Second World War. Note: This is an introduction on the matter, a starter article. 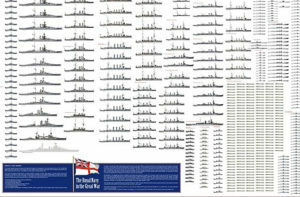 It will be extensively rewritten soon, with the carrer of each ship detailed, and posted on Facebook. This massive class wanted by Stalin was to answer the armada of American cruisers of the Cleveland and Baltimore classes. A total of 50 ships were planned to give the USSR a definitive supremacy. But this unrealistic figure was quickly reduced to 24, and then 20, which were actually started between 1949 and 1955 at the shipyards of the Baltic, admiralty yards, Nikolayev and Severodvinsk. This was completed by amazing plans for the Stalingrad class battlecruisers. The death of Stalin had these plans completely scrapped. The idea of a classic battle fleet at the insistence of the Kremlin’s master, which had the same appeal perhaps to Hitler in terms of delusional grandeur, was no longer the priority of the day. Instead, Kruchtchev, well adviced by the new head of the Soviet admiralty, had less ambitious plans, but more practical and a realistic, pragmatic approach for innovative solutions to deal with the US Navy supremacy, rather than trying to cope in numbers on the same level. This became the first steps for a new policy which endured until the 1980s. Of this total of twenty, two of these cruisers never even reach the launching stage, being canceled and broken up along the way, and four more were never completed and remained anchored in the Neva estuary in Leningrad until 1961. Only 14 cruisers were finally completed between 1952 and 1955. The Sverdlovs were much like the Chapayevs, but had greater autonomy thanks to larger hull dimensions allowing the installation of generous oil tanks. They also had a better overall protection, with a double hull on 75% of her length, and 23 watertight compartments. These cruisers inaugurated new radars and fire control systems, plus new 100 mm mounts for their secondary batteries, copied from the German dreaded 88mm Flak battery, also used on the Skoriy class destroyers. The 152 mm (6 in) main turrets were improved versions of the Chapayev ones. The final, revised design was adopted in May 1947. 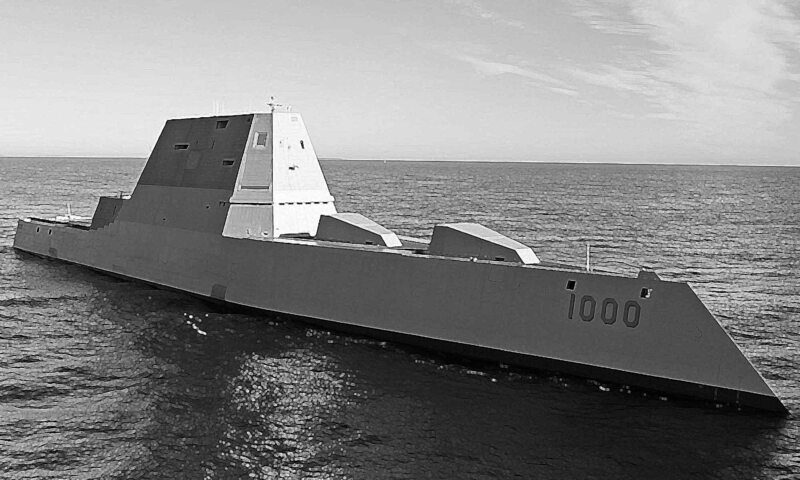 In 1960, these ships were already outdated in the face of missile warfare. 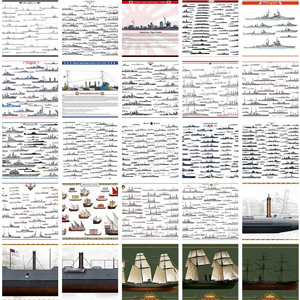 Some of these ships were then converted (as the Americans had done) into missile cruisers. Thus, Admiral Nakhimov was rebuilt barely two years after entering active service as an anti-ship missile cruiser, equipped with AS-1 missiles, then SS-N-1 “Scrubber” missile, using a replacement launcher at the same time. She also kept half the turrets. This conversion proved a disappointing one, and the ships was eventually used as a target and then scrapped in 1961. Dzerzhinski was equipped instead of three turrets and a SA-2 “Guideline” SAM was installed. It was a navalized version of the land launcher. This time the conversion proved a success and she had a long active career, being retired in 1989. 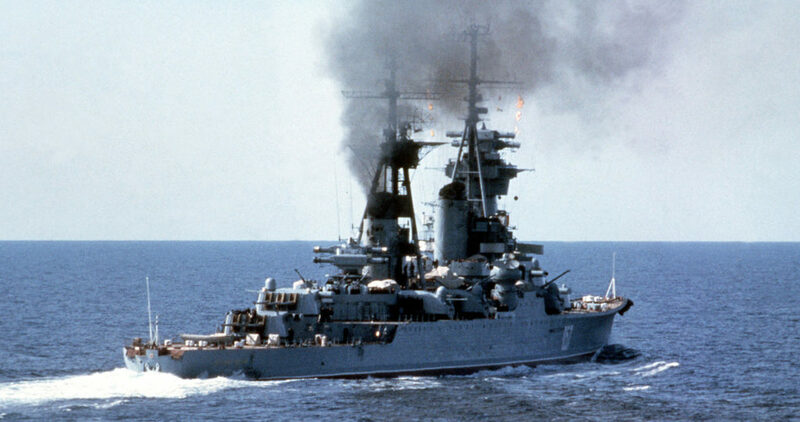 Zhdanov and Senyavin served as command ships, being completely rebuilt in 1970-72 in this role. They received a lattice mast supporting very powerful Vee Cone antennas, satellite relay, the whole rear part being converted into a flight deck for three ASW helicopters, complete with a with hangar, and a retractable missile launcher SA-N-4 “pop-up” plus antimissile superfast 30mm guns. Revolutsiya, Ushakov and Suvorov received a new enlarged footbridge and more modern electronic equipments in 1977-79, yielding their 3 7mm guns and Egg Cup firing control systems for four 30 mm missile-controlled guns by NATO “Drum Tilt” system. A starboard quarter view of a Soviet Sverdlov class Aleksandr Nevsky cruiser underway in 1982. The Sverdlov class comprised the Sverdlov, Zhdanov, Admiral Ushakov, Admiral Senyavin, Alexandr Suvorov, Dmitri Pozharski, Ordzhonikidze, Alexandr Nevsky, Admiral Lazarev, Dzerzhinsky, Admiral Nakhimov, Mikhail Kutuzov, Oktyabrskaya Revolutsiya, and Murmansk. They were equitably divided among the four fleets. Orzhonikidze was sold to Indonesians in 1962 as KRI Irian. She Sold for scrap to Taiwan in 1972. Nakhimov was written off in 1961, the others in 1987-89. 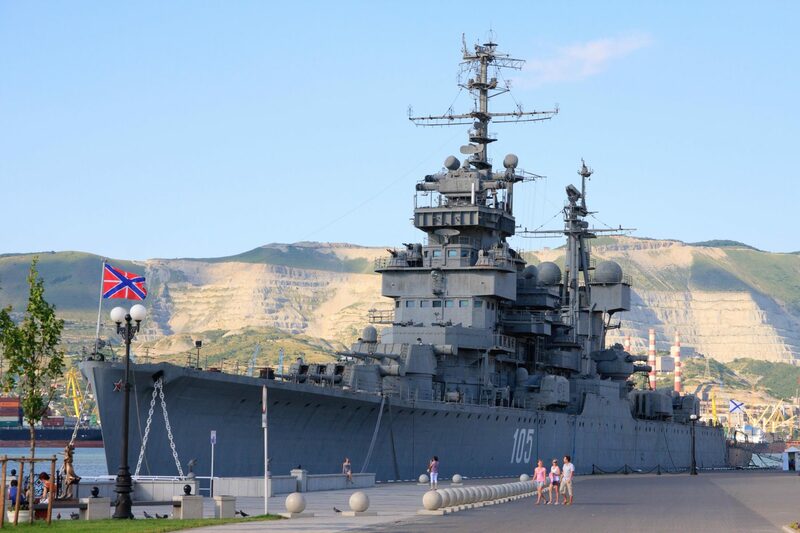 There were still three of these cruisers in service in 1990: Suvorov, Senyavin, and Murmansk. They were retired in 1990-92, with no budget and no use to support them. Propulsion: 4 shafts, 4 turbines, 4 HP boilers, 110,000 hp = 32,5 knots. 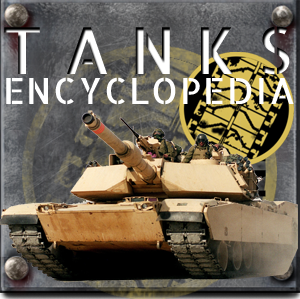 Armour: 50 – 80 mm (3.8 in), blockhaus 120 mm (4.7 in). Electronics: Radars: Sea Gull, Knife Rest A, Slim net, Top Bow, Egg Cup, hull passive sonar. Weaponry: 12 x 152 mm (4×3) (6 in), 12 x 100 mm (6×2) AA, 32 x 37 mm (16×2) AA, 10 x 533 mm TTs (2×5) (21 in).